Raytheon is one of the world’s largest defense and aerospace companies, so when it came time to combine several Washington, D.C. area offices, Loudoun worked hard to win its business. The company sought to consolidate D.C.-area facilities from two business units while allowing for future growth. 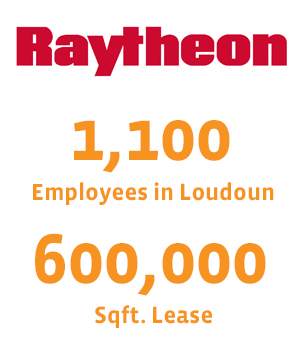 Together, elements from the Intelligence & Information Systems Group and the corporate headquarters of the Raytheon Technical Services Company account for more than 1,100 employees who are now working in their new offices in Loudoun. The availability of a 600,000 square-foot lease of high-quality office space in Dulles, VA provided an opportunity in the making. “Long-term costs were a consideration, and this site provided these advantages, but there were issues to be worked through. Not many competing sites in the region offered campus space near an airport like this site, but Raytheon employees needed better, easier access in and out of the area. Terrie Laycock of the Department of Transportation Services did an incredible job piecing together transportation funds and working with VDOT to improve Pacific Boulevard. Loudoun’s Board of Supervisors approved Terrie’s recommended funding reprogramming in a 9-0 vote. The project also became eligible for $3.5 million in state grants. This could have made a critical difference in the Raytheon deal had it not happened.